The Webley Blackhawk is a great hunting rifle that shoots at around 11.5ft/lbs, about as powerful as you can own unlicensed, making it perfect for taking out vermin and pests. This high power also makes the rifle more accurate at range than other lower powered guns. This is because the pellet stays on a flat trajectory for longer and maintains its energy for added impact. 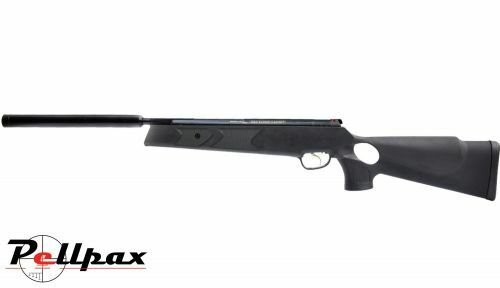 This version of the Blackhawk features a QGSII silencer to greatly reduce muzzle noise and with the rifles fully adjustable two stage trigger, the Blackhawk offers fantastic control over shot placement. The rifle also features an automatic safety. The synthetic thumbhole stock of the rifle has been designed to suit shooters of any size or shape and can be used effectively either standing, sitting, or lying down.